Meijer's Rust Guest Farm is a working farm which offers a wide variety of accommodation options within the heart of the stunning Meiringspoort, just outside the beautiful village of De Rust. Meijer's Rust offers guests a choice of staying in the lovely Stone House, a Chalet, the Milk Barn or the Campground in the mountains. The romantic Stone House is located on a plateau and is ideal for two people. The house is furnished with a comfortable double bed and has an outside bathroom that consists of a bath and shower. The unit is equipped with a gas fridge and a stove, as well as a built-in braai area. The house is also a good starting point for the farm’s wonderful hiking trails. The open-plan Chalets are furnished with comfortable queen-size beds and have sleeper couches for two children. Extra bedding is available and each en-suite bathroom consists of a bath only. The units are air-conditioned and each has a kitchenette equipped with a stove, microwave, fridge and tea and coffee facilities. The air-conditioned Milk Barn is located near a Chalet, but offers privacy. The cottage has two bedrooms that are furnished with a double bed and bunk bed for children. The bathroom is shared between the rooms and consists of a shower only. The kitchenette is equipped with a stove, microwave, fridge and tea and coffee-making facilities. The Campground is located high in the Swartberg Mountains and offers spectacular views over the Kamanassie and Outeniqua mountains. 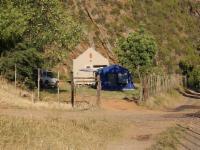 Ablution facilities with hot water and braai facilities are provided, but please note that the Campground can only be accessed by 4x4 vehicle or motorcycles. Meijer's Rust offers lovely hiking trails that take you to the top of the Swartberg Mountain and can lead to natural waterfalls and pools, as well as rare San rock art. Really fit guests can enjoy mountain bike trails with an elevation level of 500 m. Birders will love the area as over 180 species have been recorded on the farm and a wide variety of plants can be seen. 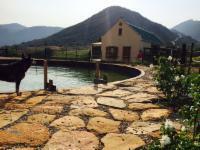 Family friendly: We are a working Cattle farm with Horses & Eland, endless space for children to run and have adventures, dams to swim, hiking trails, for the very adventurous you can find the waterfall and swim in the icy cold mountain water. Please note that when families book for camping, children under 12 will stay for free when accompanied with parents. What a pleasure staying at Meijer's Rust Guest Farm. The facilities are modern and clean and the owners were the perfect hosts. I will definitely recommend Meijer's Rust if you need accommodation in the Oudtshoorn / De Rust area. Maybe you can put up a sign indicating "Reception"
Ons het heerlik gekuier in die pragtige plek. Lekker warm geslaap en gestort en die eenheid is goed toegerus. Ons het net n paar keer in hondemis getrap wat bietjie ongerieflik was om skoon te kry en ontslae te raak van die reuk. Meijer's Rust Guest Farm is 4.3km from the centre of De Rust , the nearest airport 63km (George Airport).